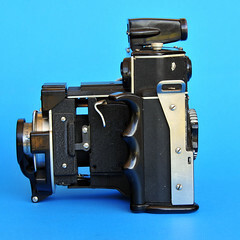 The Simmon Brothers, known for their line of enlargers, built one camera for the civilian market, the Simmon Omega 120 rangefinder camera, for 6x7cm exposures on 120 roll film. 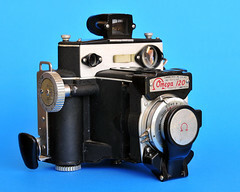 The camera was a design by Alfred Simmon. 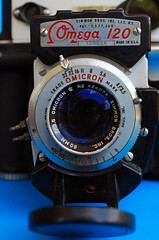 The Simmon Omega 120 camera was the design precursor to the Koni-Omega series of cameras. 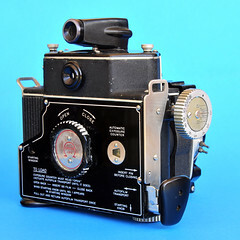 The Omega 120, released in March 1954 by Simmon Bros. N.Y., came with coupled rangefinder and a with 90mm f/3.5 Omicron lens in a Wollensak Rapax Synchro flash synchronized shutter with speeds from 1 sec to 1/400 sec plus B.
Omega 120 at Sociedad Ibero-Americana de la Historia de la Fotografia Museo Fotográfico y Archivo Historico "Adolfo Alexander"
Omega 120 with Omegaflash 120 bulb flash unit, sold at the 27th Camera Auction by Westlicht Photographica Auction. ↑ Patent US169343 at Google. This page was last edited on 5 December 2017, at 06:45.